Can a cream really be better than Botox? It’s the cosmetic holy grail, surely — a way to get rid of your wrinkles without needles or pain. So what if I told you that this magic ingredient not only exists, but that it’s already used in creams that are available on the shelves of your local chemist? You might think it was too good to be true. Yet researchers from Reading University recently identified Matrixyl, a chemical included in everyday skincare products, as a genuinely effective anti-wrinkle ingredient — despite its lack of publicity. And to test how Matrixyl performs on middle-aged skin, we asked two writers in their 40s to swap their usual moisturiser for one containing it for a month. So why haven’t you heard of this miracle substance before? It was first patented in 2000 by Sederma, a French company that is the world leader in developing anti-ageing ingredients. The first scientific paper showing that Matrixyl stimulated collagen production and improved the texture of sun-damaged skin was produced in 2005 by scientists working for Proctor & Gamble. They performed a three-month trial involving 93 women aged 35 to 55, who were asked to put a moisturiser containing Matrixyl on one half of their face and the same moisturiser without Matrixyl on the other half. The scientists then reported a ‘significant improvement and reduction in fine lines and wrinkles’ in the skin that had been treated with Matrixyl. Olga Gracioso, of Sederma, says: ‘We know Matrixyl is effective, but manufacturers want consumers to believe efficacy is coming from something else — an ingredient that is unique to their product. It’s a marketing gimmick of the highest order — regardless of scientific evidence for its efficacy, skincare manufacturers have discovered we are all suckers for something new, ‘better’ and more elegantly packaged. Whether it’s a new mineral formulation or some unique ingredient found in the depths of the ocean, some cosmetic companies will try anything to make you believe they’re onto a winner. ‘Part of the problem with the cosmetics industry is that even if something works, selling more products is more important than selling (a smaller amount of) the best ones,’ said one senior industry scientist, who didn’t want to be identified. And let’s not forget that the anti-wrinkle business is big business — we spend more than £2 billion on creams a year. But now news of the scientific studies is out, it’s likely that we can expect a rush of new advertising campaigns from companies describing the benefits of an ingredient that has been there all along. So should we all be stocking up on Matrixyl-containing products before everything is re-packaged — and re-priced? ‘There is clinical data showing Matrixyl can stimulate collagen production in ageing or sun-aged skin,’ says Chris Griffiths, Professor of Dermatology at Manchester University. At 45, I’ve always had good skin (with a few wrinkles), but anything that improves it can only be a bonus. StriVectin SD Power Serum (£79, selfridges.com) claims to boost luminosity and reduce the size, length and depth of wrinkles. Before I start using it, Nick Miedzianowski-Sinclair at the Cosmetic Imaging Studio analyses my skin in terms of wrinkles, moisture, redness and sun spots with a VISIA cosmetic imaging machine. My wrinkles score 89/100, which is good for my age — the higher the score the better. I get 31 for moisture and 42 for redness and sun spots. 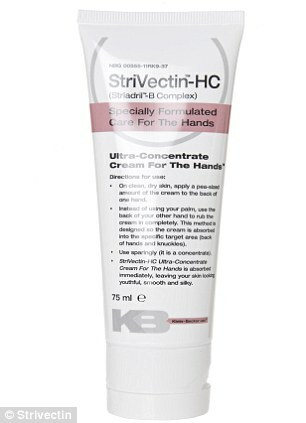 I return to the studio after using StriVectin SD every morning and night for four weeks. The tests reveal my wrinkles have reduced — my new score is 91/100 — even though for full results the cream should be used for another four weeks. My moisture score has gone up to 34. The only thing that has worsened is redness, but Nick explains this could be due to a change in the weather. All in all, I’m a Matrixyl convert. I’d like Matrixyl to give me my 18-year-old face back, but I’ve tried enough ‘miracle’ creams to limit my expectations. Before the four-week experiment, the VISIA 3D imaging machine maps my facial imperfections and I’m doing better than the average 40-year-old in the wrinkle department — 55/100. But my pigmentation and redness are bad — 20/100. 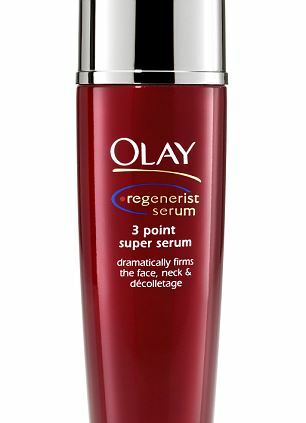 I resent spending large amounts on face cream, but Olay Regenerist 3 Point Super Serum (£24.99, boots.com) contains Matrixyl, so I apply it every morning and evening. It goes on easily and although I have sensitive skin, there is none of the irritation I’ve had with other ‘plumping’ face creams. Four weeks later and, despite my scepticism, the VISIA scan is astonishing. The cream hasn’t lessened my redness, but it has almost eradicated the wrinkles round my eyes — I score 95/100. My moisture levels have also increased significantly. So full marks to Olay. This is going to become a regular fixture on my shopping list.